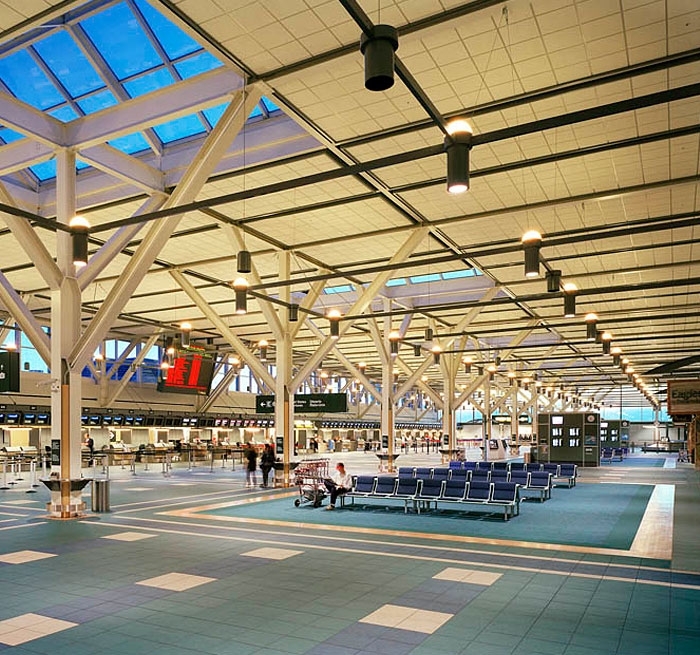 Auerbach Glasow’s lighting design played a vital role in the structural look and feel of the 750,000-square-foot expansion to the existing Vancouver Airport’s International Terminal Building. The lighting is designed to play off the architect’s vision while adding a strong visual element to the interior design of the space which features British Columbia themes and many open spaces. 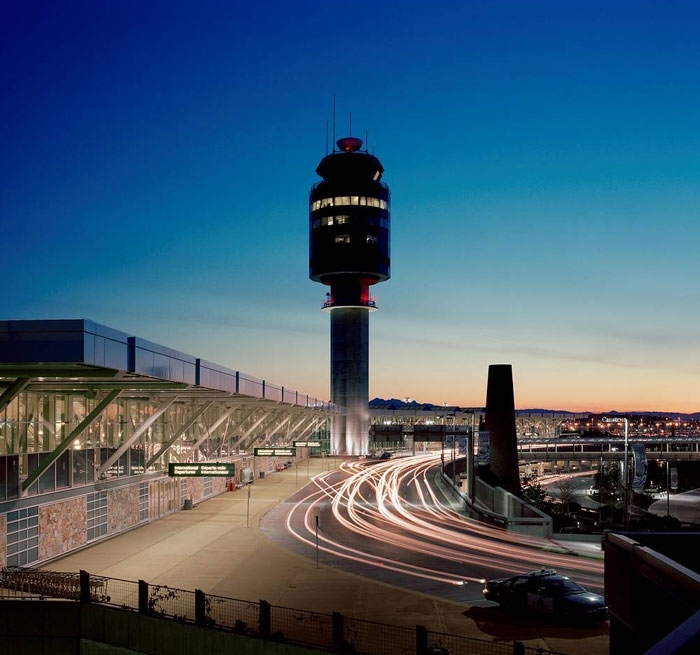 The lighting creates a sense of grandeur and awards the passengers with a positive first impression of this airport. Suspended sky bridges, affording spectacular views, are fitted with indirect fixtures hung in a chevron pattern and point the way as passengers cross over skywalks on their way to customs. At arrival level, fixtures integrated into an overhead flying bridge illuminate the three-story atrium while a pattern of indirect fluorescent fixtures around the perimeter guide passengers towards baggage claim. This regular pattern of fixtures gradually fractures and forms a logjam of fixtures heading towards the exit. The fixtures in the double-height main ticket concourse are suspended in each bay and are composed of a broad distribution uplight mounted over a general distribution downlight. The uplights create a soft glow on the ceiling and reveal the volume of the space while the downlights do the workhorse job of illuminating the floor for public circulation. 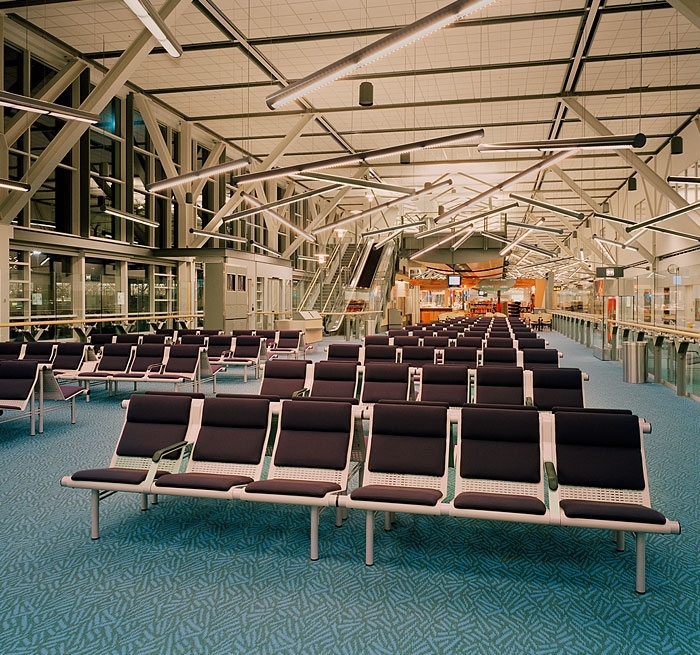 Supplemental lighting comes from furniture mounted task lighting at each ticket counter.